One of the reasons I started this blog was to celebrate print as an art form and a skill, and to highlight inspirational printmakers from around the globe. 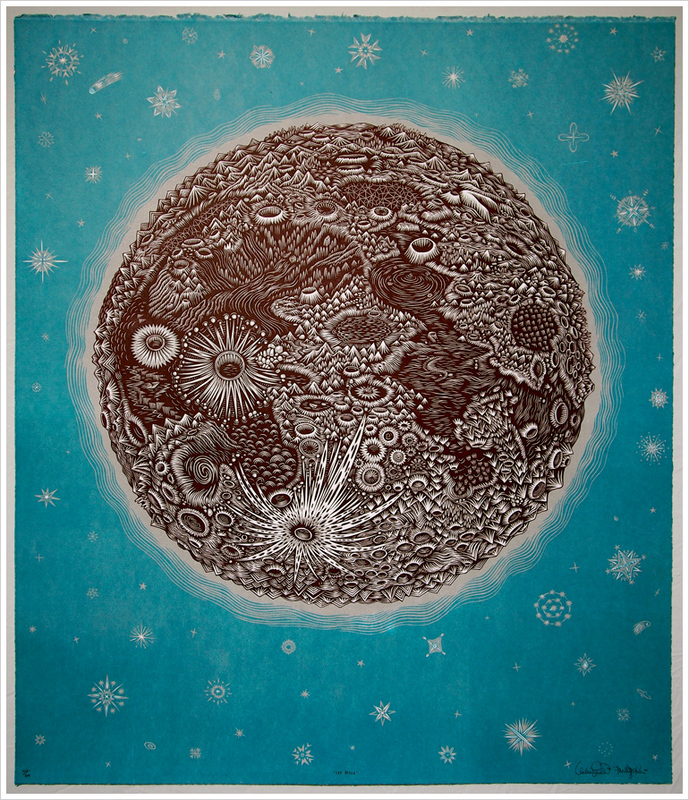 Enter husband and wife team, Paul Roden and Valerie Lueth, who have been printmaking together since 2006. 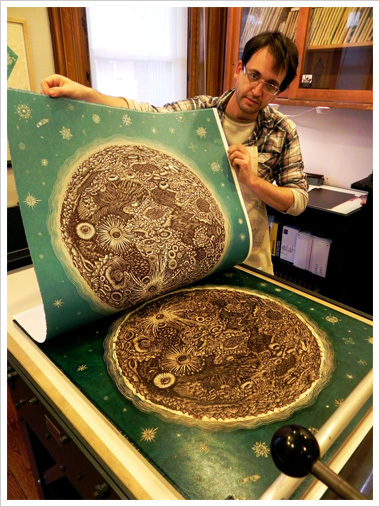 They are known as Tugboat Printshop and print from their workshop in Pittsburg PA, US. Just look at the detail here. Woodcut printmaking is an extremely labour intensive affair, and at this level of detail, even more so. 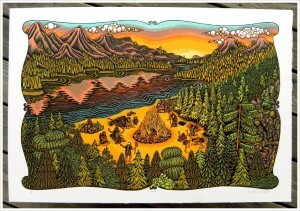 These prints seems to bridge old and new print methodology as they use woodcuts to make some pretty big prints. It’s as if Thomas Berwick went mad on Red Bull and couldn’t stop. What I really love is the fact that they show the blocks. I am a huge fan of this, and I have always enjoyed showing the process when showing people my own work. Not only do they show the blocks, but they also show lots of pictures of the prints going through the press – it is really is awesome for a print geek like me. 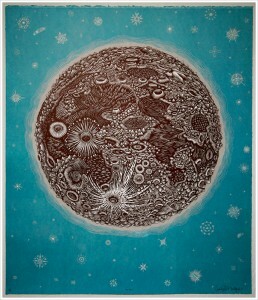 The particular print which caught my eye was “The Moon” (2012). This is a great example of the stark graphic quality which you only really get from a cut, be it lino or wood. Look out for future articles and video tutorials on relief printmaking – I work in lino and woodcuts myself. Though “The Moon” is from a limited edition of 200 prints and will set you back $550, it is a huge print. I have to say that I think that all of their work is extremely well priced, so if you are looking to grab a bargain which will only increase in value head over to their shop for a look see. 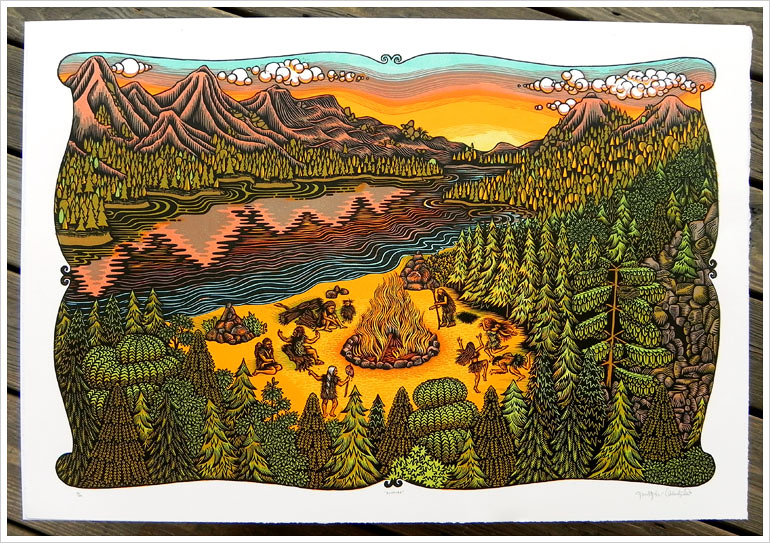 Our hope is that through our work we can foster greater public appreciation for the arts, cultivate greater interest in owning original art, & stir up newfound interest for traditionally printed works on paper. That’s a great ethos, isn’t it? I highly recommend you check out their work for yourself.